When showery weather arrives, can rainbows be not far behind? While not entirely predictable, if there is a break in the clouds, the part of the sky opposite the sun may display a rainbow. In other words, the sun will always be behind you and the rain will always be in front of you when a rainbow presents itself. Even if you can’t be sure a rainbow will appear, you can always count on seeing its color bands in the same order: red (outermost), orange, yellow, green, blue, indigo, and violet (innermost). 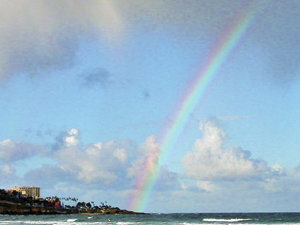 Light is not only a key ingredient for rainbow formation, it is the only ingredient because rainbows are white light — sunlight — that is split into its individual parts, which are different wavelengths, and these wavelengths correspond to different colors. Sunlight traveling through air remains in one piece (as white light) but if it strikes a different medium, like water, it splinters into different wavelengths, thereby revealing different colors. Take, for example, water in the form of rain drops. Here, the sun rays strike each drop at a slightly different angle, with each drop acting as a prism to yield a tiny rainbow. While there is no way you can see a rainbow of this size, when millions of drops have rainbows, the visible color spectrum is revealed to our eyes. We see a rainbow and not, say, a rainsquare because raindrops are round. The only reason we don’t see a circular rainbow is our orientation on land. To see a rainbow in full circle, you’ll need to be airborne or high atop a mountain peak where atmosphere is both above and below you. Personally, I’m more than satisfied seeing any size or shape of rainbow. I just like to see all the pretty colors diffusing from one to another. Nature is only partially responsible for our ability to see rainbows. Our brains do the rest because we perceive colors by three different particles in the retina. Our eyes respond to the different wavelengths (colors) with these three receptors. Though rainbows are made up of many more than seven colors, the human eye limits our thrills here. This is why we can’t see radio waves, microwaves, infrared light, ultraviolet light, x-rays or gamma rays. What may be most surprising is that rainbows can be had under water. I see them sometimes while scuba diving. As with rain drops, water in the ocean is always moving and acts like a prism just like for rain drops. In this respect, I think of the ocean as one gigantic rain drop. While I’ve never seen a complete rainbow submerged, I have witnessed pieces of rainbow when sunlight passes into the water and then bounces off reflective objects like fish scales, shiny white animal skin, or light-bending sand particles. What is so awe-inspiring about rainbows? Is it their ephemeral nature? Is it their orderly arrangement of colors? Whatever the case, rainbows are a magical meeting of water and light transformed into Nature’s color wheel where they can be savored for only a brief time. —Judith Lea Garfield, biologist and underwater photographer, has authored two natural history books about the underwater park off La Jolla Cove and La Jolla Shores. www.judithgarfield.org. Questions, comments or suggestions? E-mail jgarfield@ucsd.edu.